So, today we’re going to discuss Twitter. This is a social media platform that allows you to write status’ of only 140 characters. Not words, characters. One learns quickly to be succinct in their writing with Twitter. There are SO many places out there to direct you on step by step directions for signing up for Twitter, so I’ll leave that to them. I’m going to talk with you about how to use HootSuite to automate as much of your Twitter as possible. I’ll be dealing more with how to read the feeds you want more than how to auto-schedule tweets, though I’ll cover a small part of that. If you’ve followed Workshop Wednesday, you’ve already downloaded and begun using HootSuite during our Facebook Workshops. If not, now is a great time to get it downloaded and set up. Hold on to this, we’ll be using it soon. First, let’s get started with Twitter Lists. You may also want to take a look at Tweriod, which helps you to find out when your followers are online the most. Or perhaps you’d like to try Social Bro, which does this and much more. For instance, with Tweriod, it tells me that my best time to tweet to followers is between 11 am.-noon and from 3-5 pm on Weekends. On Sunday, the times are 9 am and 10 am, 11 am and 12 pm, 3 pm and 4 pm. On Monday, it changes to 9 am and 10 am, 11 am and 12 pm, 1 pm and 2 pm., and for the most part on weekdays, it is 10 am and 11 am, 12 pm and 1 pm, 3 pm and 4 pm. Your times will likely be quite different, as your followers may mostly be active at night. Now, let’s move on to HootSuite and those lists you created a bit ago. I’m assuming you still have the Hootsuite Dashboard open. Also, my instructions are for those who are using Pro, as I do not have the free HS any longer. For $10.00/month, it was well worth it to me to go Pro. This is the only program I can remember ever going pro on, and I’ve tried a few. To me, a few dollars a month to make it so much easier to follow your social media, connect with them, schedule posts/tweets, is worth it. Step 2: Includes several steps to do in order, as shown on pic. Follow each step carefully. Be sure to end with clicking Create Stream, so it will do this for you. With the paid version you can add pretty much an unlimited number of tabs and streams. Go ahead and follow the instructions above to create a second stream that is for one of you specific lists, such as for me, Social Contacts. Now that you have the tabs/streams set up, you can start to “listen in” on the twitter feeds. When you see something you want to reply to, hover over the tweet until you see a left facing arrow come up. Click on that to reply, and put your reply in the comment box above the tabs. When you have finished, click schedule. You can send it out now, or auto schedule. Play with HS to see how to do these things. Perhaps you want to retweet something you see while in the HS dashboard, hover over the tweet again and look at the double arrow directly after the reply button. Click this and then post in the comment box, hit schedule and do the same as above. Perhaps you want to DM the person. This means Direct Message. It to can be only 140 characters, so be brief. Again, hover over the tweet of the person you want to DM. It’s the last icon, which to me appears to be an envelope. Click it, enter message in comment box, then schedule as above. 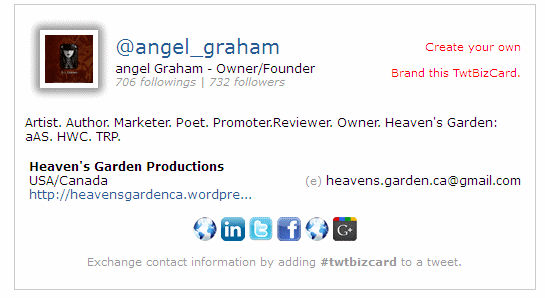 For fun, and for business, you can create a Twitter Business Card at twtBizCard. It has the basic social media sites you can add your link to, and hopefully, we’ll see more, such as Deviant Art and Behance among others. This can be a good way to link all your social networks into one easy place, and give out only URL instead of 3,9, 15 or more. It looks good and is quite simple to set up. Try it, you might like it. THere you have it. A simple way, once you set it up to stay atop of Twitter feeds without losing your mind or your hair. It takes time to set up in HS or other Management programs, but it’s SO worth it in the amount of time you save not directly going to Twitter and having to peruse the full feed. When you’re an author or business person, your time can be very limited…even for Moms this is true! Use this to make it a little easier on yourself. I’ll do a post about Hoot Suite itself in the next few weeks and give you more ideas on how to use it. For now, go forth and Twitter. By the way, don’t forget to set up your Facebook and G+ accounts in the same way. Then, you’ll be one step ahead of us in the game. Are you All A Twitter? That is, do you twitter? If so, do you want to share your @handle? Mine is @angel_graham. Feel free to follow me. If you leave a comment telling me you’ve followed, and your @Twitterhandle, I’ll follow you back for sure. Come comment and join the twittering and tweeting. There’s plenty of room.